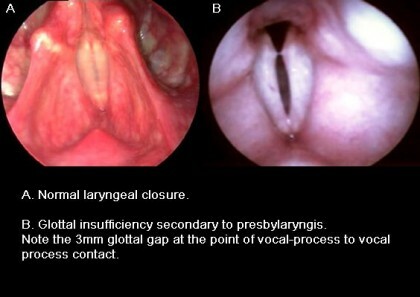 Presbylaryngis refers to age related structural changes of the vocal folds. Some degree of vocal fold atrophy and decreased elasticity is part of the normal aging process. In fact, some degree of vocal fold bowing is present in 72% of persons over 40 years of age. If the atrophy and bowing becomes severe enough, significant dysphonia, throat clearing, cough, and even aspiration (swallowing difficulty) may result. As women get older the frequency (pitch) of their voice gets lower (deeper). As mmen get older, the pitch of their voice gets higher. Patients with presbylaryngis often present with symptoms of glottal insufficiency. These symptoms include hoarseness, vocal fatigue, pain or discomfort with prolonged speaking, and diplophonia (a two-tone quality to the voice). On examination utilizing transnasal fiberoptic laryngoscopy with videostroboscopy, the bowing is often evident. Stroboscopy may reveal asymmetry or increased amplitude, indicating decreased tone. Many patients, however, may be incorrectly diagnosed as having muscle tension dysphonia. In a cohort of 100 individuals with a mean age of 61 years, 94% of patients with significant vocal fold bowing (68/72) had evidence of muscle tension dysphonia. Compared to subjects without vocal fold bowing, persons with bowing were 17 times more likely to exhibit abnormal laryngeal muscle tension (p < 0.001). Thus, some types of muscle tension dysphonia may be a mechanism to compensate for an underlying glottal insufficiency. The reason that this distinction is so important is that muscle tension dysphonia usually responds very well to speech therapy. Persons with glottal insufficiency secondary to presbylarngis, however, do not improve as much with speech therapy. Fortunately, however, medialization procedures are usually very successful at restoring vocal quality. If you click on the video, you will see a videostroboscopy displaying severe presbylarynx. There is severe compensatory muscle tension dysphonia (MTP2 – false vocal fold hypertrophy). The atrophic vocal folds can barely be seen beneath the false folds. The patient’s voice was breathy and dysphonic. This patient required bilateral medialization laryngoplasty. Although the prevalence of presbylaryngis is high, a relatively small number of patients require treatment. The reason for this is that the larynx is very successful at compensating for an underlying deficiency. As vocal needs exceed the ability of the larynx to provide adequate vocal quality, however, individuals become symptomatic and often seek treatment. The glottal closure index (GCI- Table I) is a validated 4-item self-administered survey used to evaluate glottal insufficiency. A GCI greater than 2 is indicative of significant glottal insufficiency. A new injection technique is now available to “beef up” the vocal folds and reverse some of the effects of aging. Calcium hydroxylapatite (CaHA) is a laryngeal implant approved by the Food and Drug Administration for the treatment of glottal insufficiency. The substance can be injected into the vocal folds through the mouth in the office or operating room. The procedure takes approximately 15 minutes to complete. We have injected over 100 vocal folds with no complications and excellent results. Please see the section on our technique ofinjection augmentation of the vocal folds. If the gap caused by presbylarynx is severe, medialization laryngoplasty may be necessary.